In the recipes I searched for online and considered, I found that most apple crisp recipes called for sliced apples whereas pears were diced. Randomly enough, I instinctively figured that diced apples made more sense for individual crisps since they would sort of nestle nicely in your spoon as you scoop. These are the things I spend time mulling over! Well, interestingly (to me, anyway...), I really liked the apples sliced. Not only do the thin slices soften nicely, you can cut right through the tender apples with your spoon and the thin texture works really well and lets you taste them better in a way. This may be the elementary observation to many others but I love discovering these little things for myself in the kitchen! I baked the two crisps, side-by-side, in a 350 degree oven for about 25 minutes. Then I hiked up the oven temp to 375 for another 5 minutes to get a more golden color on the topping. ...I think the classic apple won out this time. Preheat oven to 375 degrees. Lightly grease an 8-ounce ramekin with cooking spray and set on a small baking sheet. 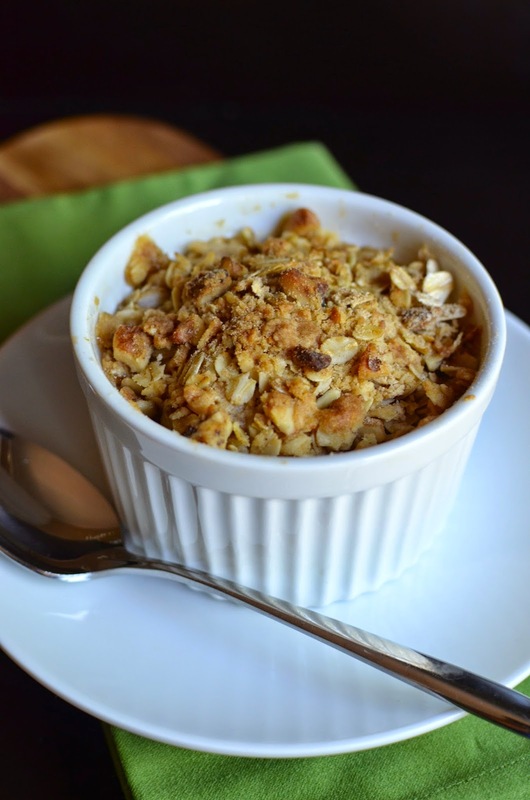 Make streusel topping by stirring oats, flour, brown sugar, and spices together in a small bowl. Cut in the butter using a fork until a coarse meal forms. Stir in walnuts and set bowl in the freezer for about 15 minutes. Stir apples together with the brown sugar and cinnamon. Place filling inside the ramekin. Top with streusel and bake for 20-25 minutes until golden brown. Let cool for about 5 minutes and serve warm with a scoop of vanilla ice cream. Preheat oven to 350 degrees. Lightly grease an 8-ounce ramekin with cooking spray and set on a small baking sheet. Stir pears together with the sugar, ginger (if using), and cinnamon. Place filling inside the ramekin. Top with streusel and bake for 25-30 minutes until golden brown. Let cool for about 5 minutes and serve warm with a scoop of vanilla ice cream. 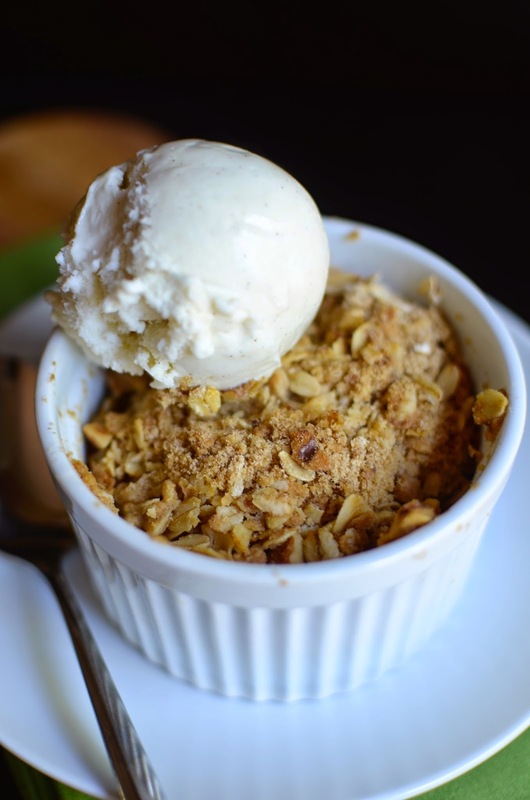 To make individual apple and pear crisps together: To do like I did (make an individual apple and pear crisp side-by-side at once), double the streusel topping. Prepare the individual fillings as listed, top each with half the streusel, and bake in a 350 degree oven for 25 minutes. Turn oven temperature up to 375 degrees and bake for another 5 minutes until topping is golden brown. And I'm one of those people who would always choose the fruit dessert! Your crisps look great, and remind me that I haven't made one yet this fall. Either apple or pear would be terrific. haha - the world needs all kinds of people! ; ) Fruit desserts have definitely grown on me...I love plenty of fruits now but I always figure why dress/cover them up when they are so good just plain and fresh. Funny how I have no such notion when it comes to chocolate desserts! I'll definitely look to fruit-dessert experts like you for guidance! : ) I love these kinds of fruit desserts that are warm...I love the contrast of warm filling and cold ice cream. Uh oh, now I'm thinking souffles! These both look and sound lovely! Love the individual servings! Oh this dessert is calling my name! I love the apple/pear combination, plus fruit crisps are my favorite year round. This crisp looks like it wants to become my new best friend. I want to become it's too! The struesel top is always my favorite part. And, I so want to go cherry tomato picking now! I'm a huge fan of cherry tomatoes, and I didn't get to plant a garden this year! Maybe I'll bury my sorrows in this fruit crisp. I think that sounds like a perfectly good (and delicious) idea! I know it - streusel toppings rock! I roasted my tomatoes (they cook down to nothing) and the flavor is so intense and there's so much moisture. Love it! I have a brown thumb so no gardening for me though. I totally related to this post! I am definitely a chocolate over fruit dessert eater but recently discovered fruit crisps are great, especially if you've had an earlier dinner and want a more substantial dessert. And the kick of ginger is such a great touch! Yay - a chocoholic who relates to me! I'm so glad to hear it! And I'm with you - I'm also glad to have branched out. There's room for a lot more than I ever realized as a kid! These look gorgeous Monica! So warming and seasonal. The pear and ginger sounds divine!! I can almost smell the warm spicy crisps all the way from your oven. The streusel is always my favourite. I tend to make a double batch and throw in some chocolate with it. Your post is making me crave crumbles and crisps now..I am not a very autumn-winter person as our autumn-like weather is short and the cold just takes over forever. But seriously for once, I am missing Autumn. Especially for these crisps. I like them both...and should love to have both in one serving...yes, with ice cream! Fruit crisps are my absolute favorite. I've never made one with pear though. Must try! Just gorgeous Monica, you can cross this one off your list as you have mastered it. I love fruit crumble and love your pear wight he little bit of ginger, that sounds so good. I know that fruit crumbles with berries are usually made in the summer but i love eating this one hot out of the oven wen the weather is a little cooler with a big dollop of ala mode on top, melting and delicious. Fruit crisps, fruit cobblers rock! Love, love these types of desserts. Thanks so much! I'm a little doing anything for the first time but I always learn something and that is awesome. My goodness this looks perfect! I have such a long list of things I want to make. I think I still have about 50 summer recipes I never got around to making. Chocolate - one of my favorites too - always picked chocolate as a kid. Pears and apples and a big scoop of ice cream - yes please! Have a great weekend! I know- sometimes I shut down and forbid myself to look at cookbooks, magazines for a while! There are just so many things I want to make. You have a great weekend ahead! 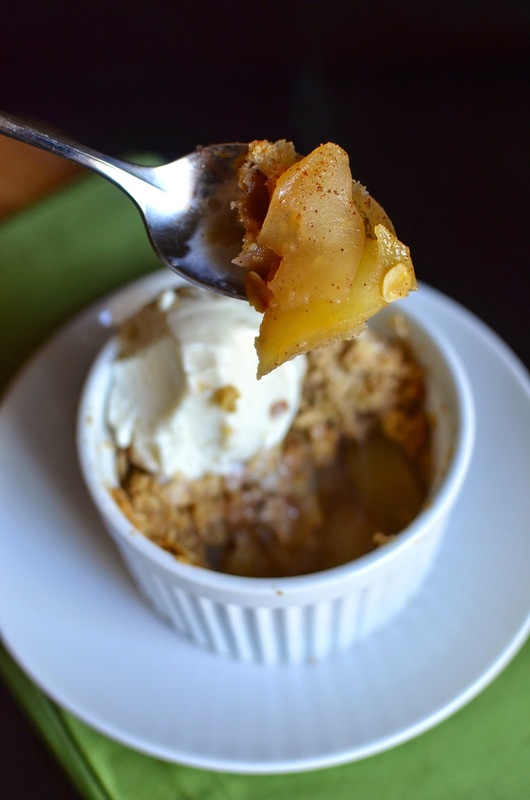 I love delicious fruity desserts, and even more when paired with crisp! This looks fantastic, Monica. i had to smile at your first paragraph, b/c my sister is famous for her line "i don't like fruit desserts." or at least she didn't: in recent years she's come around on some (and she's always liked apple pie), but she would rather do chocolate also, most days. I love your crisps! they're among one of my favorite things to make in the fall - in fact, i'm overdue to make one by now, i think. i agree about the dimension: walnuts and pecans both (sometimes hazelnuts) make a nice addition to the topping, and give a great texture to the dish. I can relate to your sis, that's for sure! And I'm with you on adding nuts to streusel and other toppings. I don't know if it's the crunch of flavor but I guess it's the combo of both. Chocolate in streusel has been suggested...and I am intrigued! OMG! Planning to make it on this weekend! Having guests over and they are vegetarian. It's really the perfect dessert! oh wow - glad it gave you an idea but I can't imagine any better dessert than some of your amazing cookies. Then again, they might be too pretty to eat! I needed some "individual" dessert menu and I was pleasantly happy to see this recipe today! Looks good. I will try this. My kids are really into apples and we have a lot of apples at home (only kids eat). I like apple desserts more than eating apples by themselves. This will become handy in our house for the next few weeks! Wow! Monica, I can't believe I haven't seen your blog redesign until now. It looks so, so nice -- very clean and aesthetically pleasing. I really love it. School has really been just crazy, so I deeply apologize for being so behind on the happenings of the blogs (like yours!) that I normally check up on regularly. Back to the topic of desserts! I'm totally with you on the chocolate boat; when given the choice between chocolate and fruit, chocolate always wins for me (: But that being said, I very much appreciate a good fruit dessert as well! 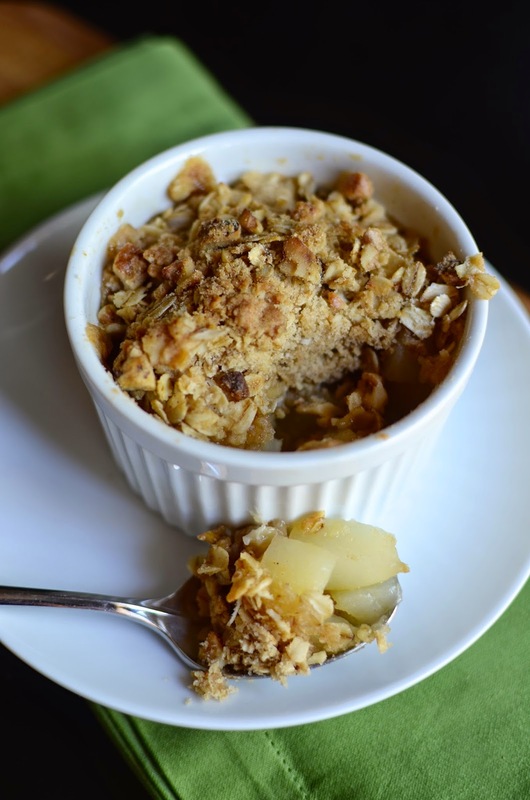 This apple and pear crisp looks amazing; I love the addition of chopped walnuts and pears -- even better! Thanks, Monica! I know you must be insanely busy...thanks for taking the time to stop by when you have the chance.